Are you looking to give a period home a new lease of life? Whether you're confident with colour, or more cautious, passionate about print, or prefer the plain and simple look, there are plenty of ideas to suit all tastes, which, though of the moment, still have enduring appeal and will translate well in a period home. As a basis to inspire your brand new scheme, we've rounded up the best – and latest – design ideas for your walls. Find more inspiration, advice and tips on our dedicated design hub page. Don’t lament the dark winter days, instead embrace them with floral wallpaper designs in midnight shades for a sophisticated, feminine look. For real wow factor, try this A Bowl of Flowers mural from the original painting by Marie Blancour, from £65 per m2, The National Gallery Collection at Surface View. Is period drama your thing? Then check out these 19 dark and atmospheric decorating ideas. Let the iron-rich reds and flaming oranges of oxidised metals inspire a warm, earthy scheme. Perfect for creating a cosy and inviting living room, especially when teamed with natural materials and textures, this Chestnut paint is £38 for 2.5ltrs of matt emulsion at Neptune. For more inspiration, check out how to choose paint for a period home. Naturally soothing, evergreen shades continue to be one of this year's key interior trends, yet they also have a timeless appeal that’s perfect for period homes. 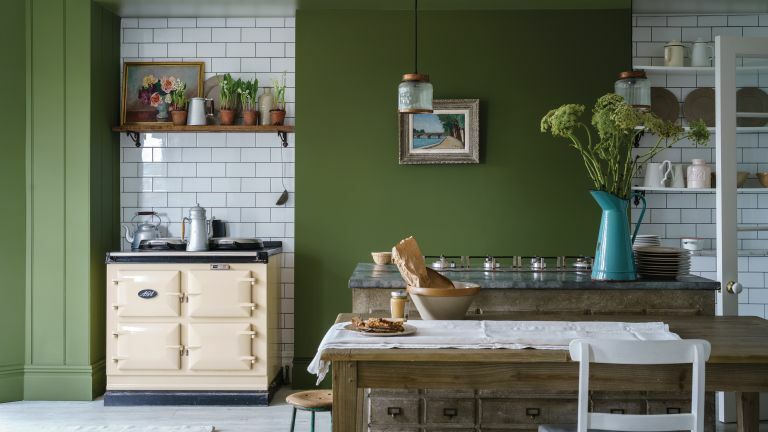 Energising and fresh, Farrow & Ball's new Bancha shade, used wall-to-wall in a kitchen, is guaranteed to lift the spirits. For more green decorating ideas try these green living room design ideas. Bring vitality to everyday living spaces with leafy wallpaper designs, from perfect palms to a tapestry of treetops. For a fresh new look in a townhouse kitchen, try Lighthouse Palm wallpaper in Chelsea Green, £95 per roll, Paper & Paint Library. Looking for more inspiration? Check out these 11 beautiful botanical wallpapers. Don't miss our kitchen wallpaper design ideas, too. From the aqua shores of the Caribbean to captivating teals of rocky Mediterranean coves, fill your home with a breath of fresh sea air with an ocean blue palette. New from Sanderson, this Newby Green used wall-to-wall will immerse you in watery bliss. £43 per 2.5ltrs of Active matt emulsion. For more inspiration check out these 15 traditional bathroom ideas. Decorating schemes that give a nod to the motifs and traditional designs of the East are having a moment. So why not use this as a beautiful, on trend starting point for your room's transformation? Inspired by Chinese and East Asian design, these elegant climbing florals and landscapes are a blossoming trend this season. From repeat patterns to statement murals, there are plenty of options, including this beautiful hand-painted Japanese Garden wallpaper on dyed silk, from £1,173 per panel at de Gournay, which looks stunning teamed with Perch & Parrow’s Simon two-seater sofa in Fresh Azalea velvet, £870. Perfect for creating an elegantly patterned living room and ideal in a bedroom, these designs work well with formal, traditional furniture and sculptural Mid-century-style pieces. Be inspired by more mural design ideas – and take a peek at our maximalist design ideas, too. Want to stand out from the crowd? Think outside the box and experiment with teaming colours and tones from opposite ends of the colour spectrum. Furniture is a big investment, so opt for easy-to-live with tones for upholstery and instead introduce vibrant colour through a quick and easy lick of paint which can easily be refreshed if tastes change. Named Pantone's Colour of the Year for 2019, Living Coral is having a moment; here Habitat has tempered the saturated hue with forest green for a playful contrast. For more colourful and dramatic schemes take a look at these 12 colour block paint ideas. Get your colour clashes spot on with our guide to using a colour wheel for colour scheming. Pastel pink brings classic calm to bedrooms, but has also found favour with colour-confident homeowners looking to bring a playful touch to living rooms and kitchens. Choose from a range of sugary shades, or for a sophisticated moody edge, try Farrow & Ball’s new Sulking Room Pink, £45 for 2.5ltrs of Estate emulsion. For more inspiring bedroom looks check out these 13 traditional bedroom design ideas, and don't miss these pretty pastel room design ideas. Trick the eye and bring both texture and style to a space with these imitation surface wallpapers. From wood panelling to embossed tiles, have fun creating all sorts of intriguing effects without spending the earth. Alnwick Logs in Lacquer Black, £66 per roll, Sanderson. For more inspiring imitation wallpaper ideas check out these 11 natural effect wallpapers. Guaranteed to raise a smile, wallpapers covered with beautifully illustrated creatures are everywhere at the moment, from our favourite brands to independent designers. Try pasting up the Kingdom Lion wallpaper, £50 per roll at Graham & Brown, for a quirky way to liven up functional spaces such as downstairs toilets or even the insides of cupboards. Soothing and versatile, muted walls are a great choice for design enthusiasts looking to showcase statement pieces and prints. From off-whites through to browns, Paper & Paint Library has a wide variety of complementary neutrals arranged in tonal order. Add subtle interest by using its Paper V on lower walls and Paper III above, both £48.50 for 2.5ltrs of Pure Flat emulsion. See more white living room design ideas for inspiration.